As Fairtrade Fortnight comes to an end, I want to say a massive thank you to all the schools, places of worship, businesses and volunteers who have joined in to make it a success. There has been a lot to give us cause for concern recently – with Brexit, Trump, and Conservative cuts (readers will be familiar with the campaigns I have been running on protecting education, our emergency services, and our NHS from staggering cuts). However the campaign to make Halifax a Fairtrade town is a really positive movement and something we could be really proud of if we can pull it off. Halifax Minster’s Reverend Hilary Barber delivered the Sunday sermon in Westminster Abbey last week and I was delighted that he decided to dedicate his address to Fairtrade and our Fairtrade town campaign. 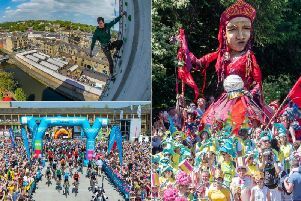 He was a great ambassador for the town and it was a fantastic end to a Fairtrade Fortnight which has proved once again that Halifax is at the centre of the movement to put ethical and sustainable principles at the heart of trade. One of the real highlights was welcoming Linda, a Divine chocolate cocoa producer from Ghana, to Halifax. Linda met students at Calderdale College where she explained how Fairtrade had improved lives in her community. Fairtrade had empowered her and other women in her village - from enabling children to go to school, to improving access to clean water. Last week saw the second annual Fairtrade Schools’ Conference at Halifax Minster where 12 primary schools came together to take part in activities including meeting author Tom Palmer and take part in chocolate tasting to get a better understanding of Fairtrade. For many this was their first introduction to international development and the impact their choices could have for helping others escape from poverty. In the midst of uncertain times, we have a lot to look forward to in the coming months in Halifax; the Piece Hall, the Square Chapel and the new library, but I am also hopeful that Halifax will be on the map as a positive, outward looking Fairtrade town. I have been shadowing emergency service responders across Calderdale over the last year and readers may remember some of the eye opening experiences I have encountered, especially with the police last summer. Last weekend I joined the fantastic team at Calder Valley Search and Rescue (CVSR) on one of their training sessions. The incredible thing about CVSR is that its team is made up entirely of volunteers and their dedication to helping those in need of assistance is fantastic. For example, the day after I trained with them they faced a call out in Hardcastle Craggs which saw 19 of their members join the response with vehicles setting off within two minutes. I will continue to support their service and want to convey my thanks to the team for the amazing work that they do.